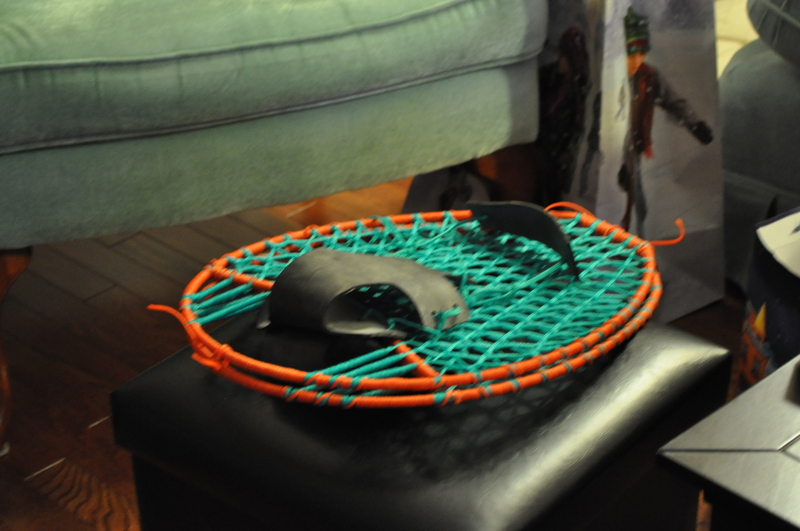 Will I need my new Snowshoes for Winter 2011? 2010 was acclaimed a year to build on experiences in Rural Newfoundland & Labrador. It is critical to reflect on past traditions and activities we participated as children to ensure continuation of our culture. When I was a child, snowshoeing was a popular activity. I would always need them when I went with dad in the woods on his old Bravo (Yamaha snowmobile) to check rabbit slips (snares). We would venture off the trail, so the snowshoes laced into our sealskin boots prevented us from sinking to our knees through deep snow. They certainly came in handy and were developed by our ancestors out of necessity. My father, born in 1961 used them during the winter season. In fact, he had the talent and skill to make them, taking much pride in each tug of twine used to lace the frame. He made many pairs, always donating one at the local winter carnival as part of a fundraising event. I have a pair he made for me before his passing, which I will always treasure. Unfortunately, I wasn’t old enough to learn at the time how to make them. It is a skill, I will try to learn from others. Since I have reached adulthood, my feet have grown and I have needed a larger pair. I was surprised when a Secret Santa present delivered a pair made by a local retired teacher during Christmas 2010. I hope maybe he will teach me, so I can pass this skill on to others. I will not forget community winter carnivals held at the local Lion’s Club, where I would participate in the snowshoe race. It was always a quick sprint to the finish. A mad dash with many people racing. We also had a unique “Newfie Snowshoe” Race, which included teams of three or four people standing on two pieces of 2″X4″ with string to loop each of your feet, extending to your hands for steering. You would be pitted against many other teams. It would be important to move as a unit or your would stumble quickly. The first team to cross the line is the winner. Talk about innovative! Newfoundlanders & Labradorian’s always think of ways to entertain and have fun. If anyone has photos of this activity, please post a comment and I would love to post them. It is January10, 2011 on the Northern Peninsula, Newfoundland with the temperature remaining above freezing point (+0) and no snow to be found. Like many other’s who enjoy the powdery white stuff and of course winter activities, which include ski-dooing, ski-ing, ice-fishing, snowshoeing, skating and rabbit catching, we will just have to wait and hope that winter will arrive soon. The video below from www.youtube.com entitled, Snowshoe to the Sinkhole at Gros Morne Newfoundland (posted by kdgdan) shows people snowshoeing in our beautiful National Park. It was not so many years ago that we would have snow eight or ten feet high on our properties. As a child I was always digging an intricate network or snow tunnels, slides and caves/houses. It was one of the biggest highlights! I remember many attempts to make an igloo. All I can say, “it is much harder than it looks”. I think they should make an instruction manual. The amount of snow dumped on us each winter certainly required a good set of snowshoes. I would choose a locally handcrafted pair over mass marketed modern engineered versions any day. Posted on January 11, 2011, in Tradition and tagged activity, Bravo, Hiking, National Park, Newfoundland and Labrador, seal, sealskin, Ski, Snoqualmie Pass, snow, Snowshoe, winter. Bookmark the permalink. 1 Comment.